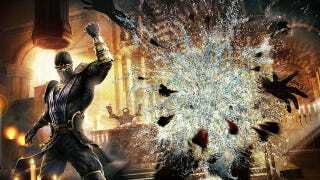 Yesterday's confirmation of a Mortal Kombat game for Sony's upcoming handheld didn't offer much in the way of details. There was cover art and not much more. Boo. "For fatalities, you can "slash" the screen with the appropriate inputs - say, away, away, up - to execute the fatality. It makes some of the more difficult fatalities easier and it's fun to slash at your screen to fire off a fatality." The veteran designer also says that two new Test Your Might-style mini-games will be on MK for Vita, as well as changes to the Challenger Tower mode that might make use of the device's gyroscope and accelerometer. There won't be any kind of PS3-to-Vita cross-functionality, though, as with Ultimate Marvel vs. Capcom 3. I, for one, look forward to touchscreen Fatalities, since they don't affect actual combat. There's nothing worse that beating an opponent and screwing up on that finishing move. Hopefully, the new input method will help with that. Head over to the PlayStation Blog for more details on Mortal Kombat for Vita.